Many long years ago, the denizens of Mount Yr Wyddfa burrowed beneath the earth; foul minded fey, goblins and others of that ilk; they fled for reasons unknown to all but themselves. On the terraced slopes, the valleys, ravines and forested highlands settled in peace, farms spread along the greens, people settled and prospered. But the world unfolds, forever turning, mirroring the past. It began with nightmares, followed by haunts hounding farmers in their fields, terrorizing them on the roads, chasing them to their sanctuaries. Then the goblins came a-hunting. Not seen in many years, now they waylay travelers, despoil their belongs or worse, killing them on the road. And to all this the terror only increases, spreading even to hearth and home. Young women have begun to disappear, kidnapped from their homes. Rumors speak of a new power, called the Grey King, who settled in the mountain. It is he that stirs up the creatures and has brought the goblins to life. Drawn by a string of random attacks on the locals, vandalism and sightings of eerie beings about the mist shrouded mountain, the characters must band together to discover the cause of this calamity. 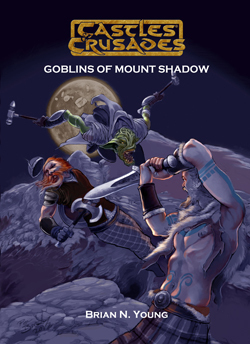 To save the local villages from further devastation, the characters will need to hunt down the goblins and find the source of their rise to power. This set of adventures is made for characters numbering 2-5 from 1st-5th level or higher, employing a diverse band of adventurers preferably with an elf or two. The campaign centers on the haunted dark mountain of Yr Wyddfa and the rise to power of the dark faeries within, being guided and led by their mysterious leader the Grey King or the Brenin Llwyd ('Brin-in Thloo-id'). The story focuses on Celtic myth and folklore may be integrated into any fantasy setting and Aihrde with ease. The locations in this adventure are essentially fictional but taken from actual Welsh sources with only a few real place-names (Yr Wyddfa, Penllyn). The rest are contrived Brythonic locations.